Professional Mobile DJ's with the latest high tech equipment, Dancers, Special Effects, Giant screen video dance party including music videos and live camera simulcasting, laser karaoke singalong, state of the art light shows, including lasers, programmed intelligent lighting and the latest in LED effects. All types of music for all types of parties. Top Requested DJ/Party Personalities will Motivate the crowd all night to dance and have fun in any situation with lots of crowd interaction. Has an Extensive music collection covering tunes from the 40's to today. Can run games and contest if desired. 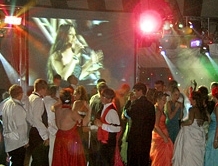 Big Beat Dancers- High Energy Dancers can be added to any party to enhance crowd motivation. A great addition to any event. 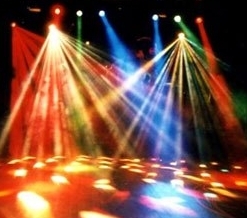 High Tech Light Show and Special Effects- various levels of dance floor lighting and effects including the latest in intelligent lighting fixtures, LED effects, smoke and bubbles. Big Beat Karaoke- Always a favorite. Your guests are the stars of the show. 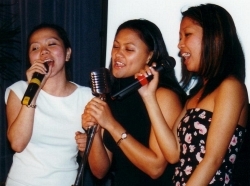 Sing along with one of our hundreds of songs through a professional sound system. The words to the song come right up on the video monitor so you won't miss a beat. 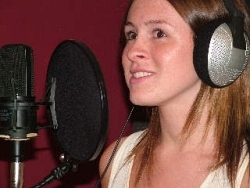 Our professional Karaoke host will encourage the singing and fun. Big Beat Portable Recording Studio- Have a portable recording studio at your event. It comes complete with recording booth, headphones, microphones and backup tracks that make you feel like you are having you own recording session. Guests get souvenir copy of their performance to take home. Big Beat Game Show- You and your guests are contestants competing in your own high energy game show. 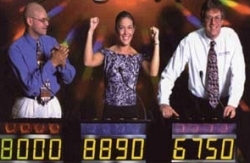 We supply the host and game show equipment - sophisticated electronic contestant stations - just like television. Can be played in teams or individual. Theme related questions available. Unique and lots of fun.